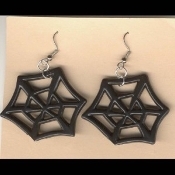 Black Widow SPIDER WEB EARRINGS - Halloween Gothic Emo Wicca Witch Charm Jewelry - Big Plastic dimensional, detailed Charm, approx. 1-1/4-inch diameter, on 18-inch Neck Chain with safety clasp. Morticia Addams and Elvira would love these!